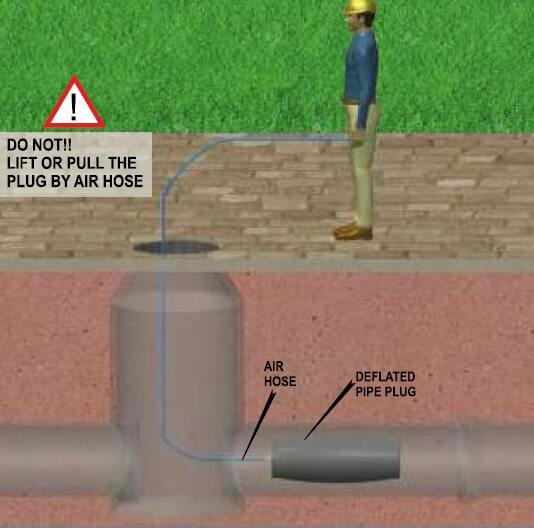 WHAT IS A PIPE PLUG? Pipe plugs have many different names such as pipe stopper, flow stopper, sewer stopper, inflatable stopper, inflatable plug, pipe balloon, sealing cushion, flow blocker and pipe bung. 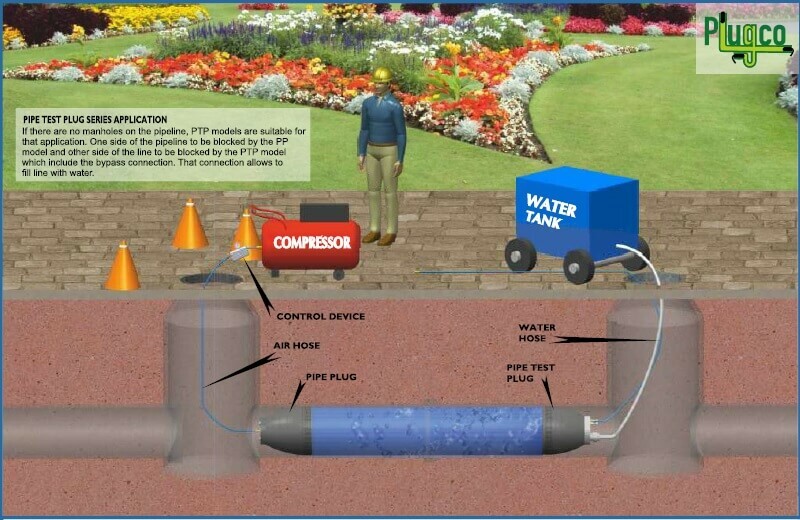 Plugs are used for blocking, repairing and testing non-pressurized gravity lines like sewer and drainage lines. 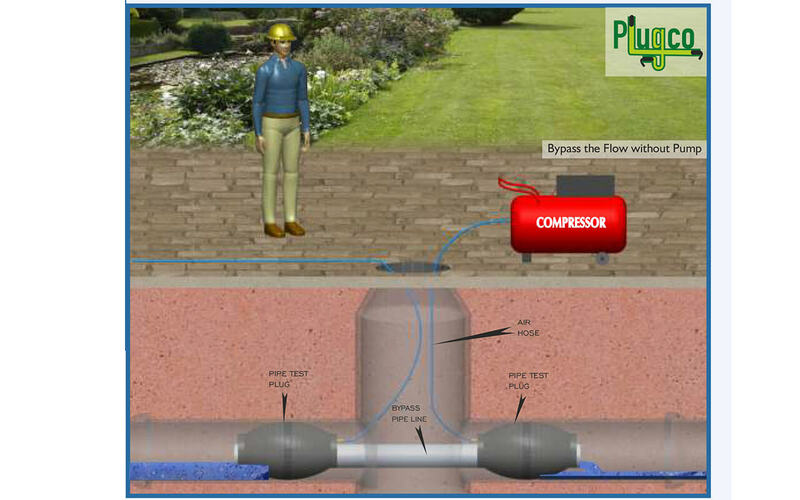 We will introduce and explain the application steps of the two models of PlugCo products, the PP model and PTP model. 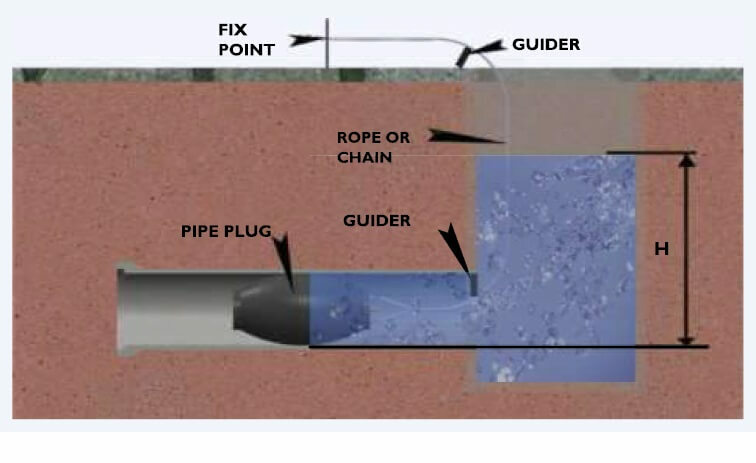 The main use of the Pipe Plug (PP) Model is to block piping or channels to stop fluid flow such as water,sewage, or drain water. 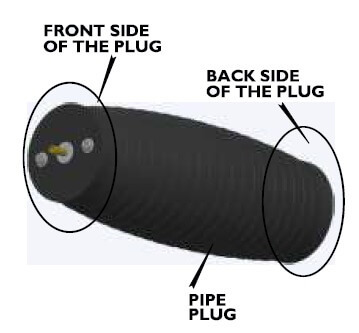 PP Model Pipe Plug includes an inflation connection and holding hooks but does not have a bypass connection. Calculate the back pressure that the plug must withstand before choosing the plug. 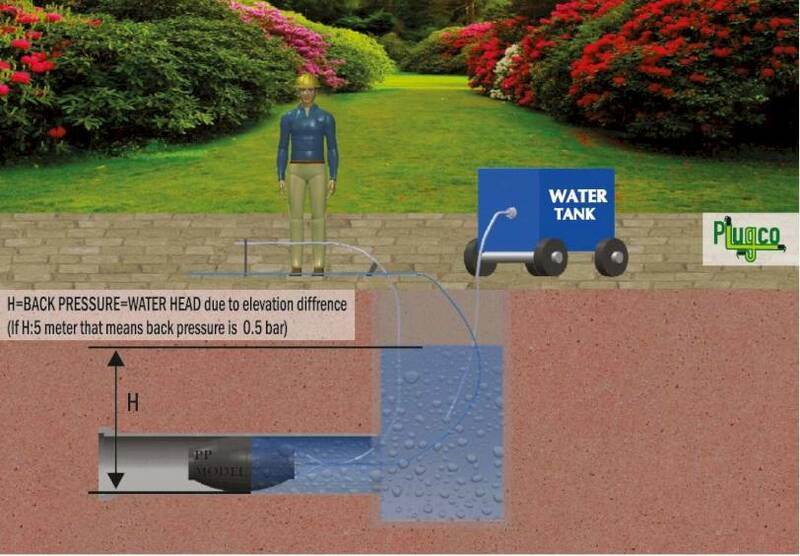 BACK PRESSURE is the elevation difference between the upstream and downstream ends of the test line; or, in other terms, the height of the water column behind the plug(Figure 3-4) 10m water column equals 1 bar back pressure. The surface area and the shape of the water column are not important, only the height of the water column needs to be considered. 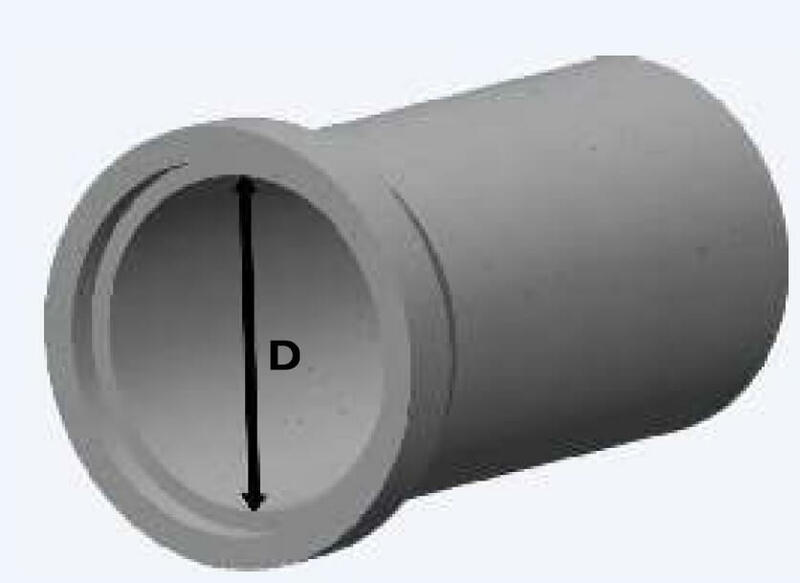 1 Measure the inner diameter D(mm) of the pipeline to be sealed by the plug. 11 Calculate the total force that plug must withstand from following equation. Determine the temperature that the plug will experience, and the fluid(s) it will contact in use. The acceptable temperature range is specified in the PlugCo data sheet. 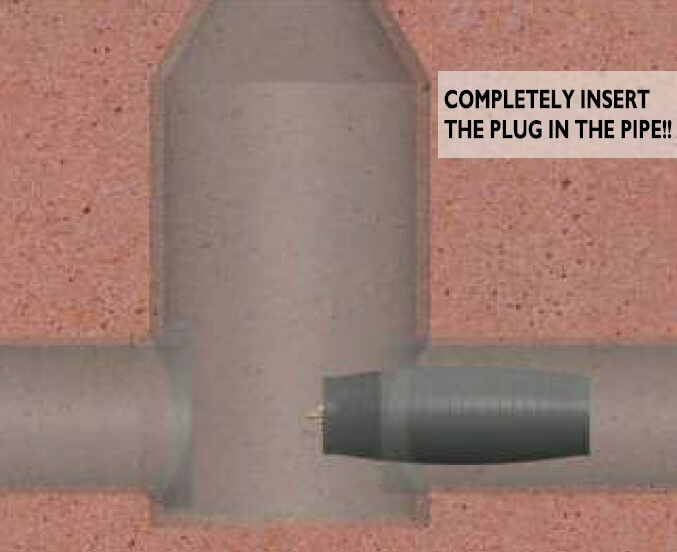 If the plug is used outside of the lowest specified temperature, the plug may stiffen resulting in incomplete pipe contact and may dislodge when back pressure is applied. Also high temperature application may cause losing elasticity of the plug. 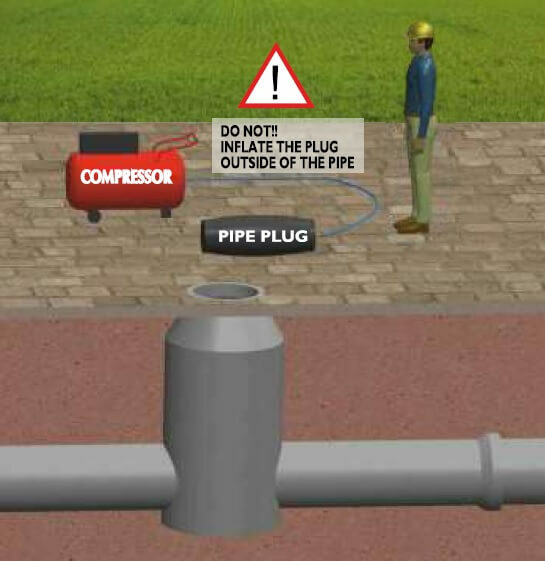 Select the proper plug and related equipment for the application. 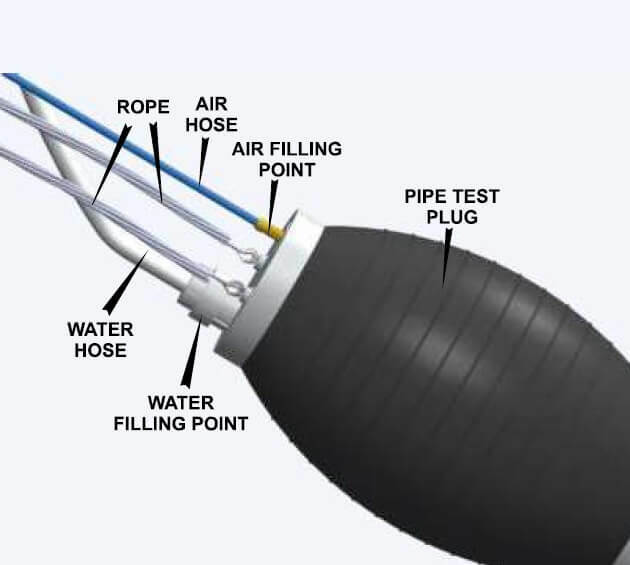 Before using the plugs measure the inner diameter of pipe . 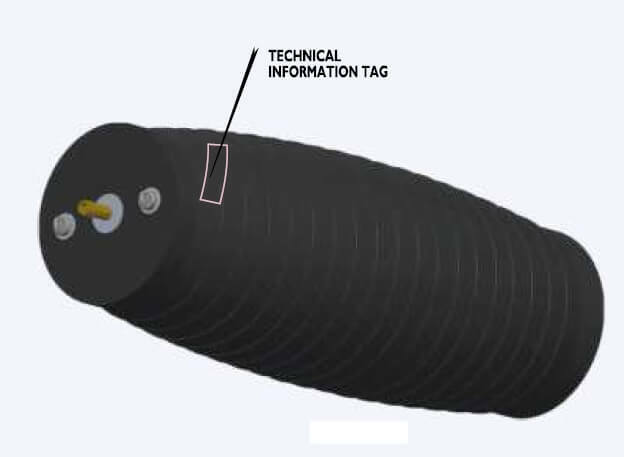 Make sure that pipeline diameter is within the range specified for the plug in the technical information tag on the plug (Figure 5) (Figure 18). Before and after each use, clean the plug with a solution of water and detergent. After cleaning, flush the plug with clean water and allow it to dry thoroughly before use. WARNING!! Do not clean the plug with solvents or petroleum products which may damage the plug! Inspect the plug and related equipment (control device, air hose, water hose…) for damage before each use by using the soapy water solution. The leaks will cause the soap bubbles to appear. Look very carefully for evidence that any part of the plug assembly has been damaged weakened or is missing. WARNING!! CLEAN AND INSPECT THE PLUG COMPLETELY. If the plug fails, or dislodges for any reason, death, serious bodily injury and/or property damage may result! If evidence of any damage such as a crack, cuts or corrosion is observed, do not use the plug. Contact PlugCo for inspection or destroy the plug and replace it with a new one. 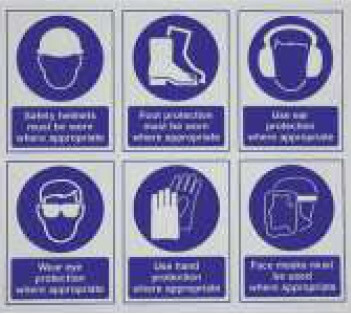 Select and use the proper safety and protective equipment such as helmet, goggles, gloves, and protective footwear. Please follow PlugCo Safety Manual for safety rules. 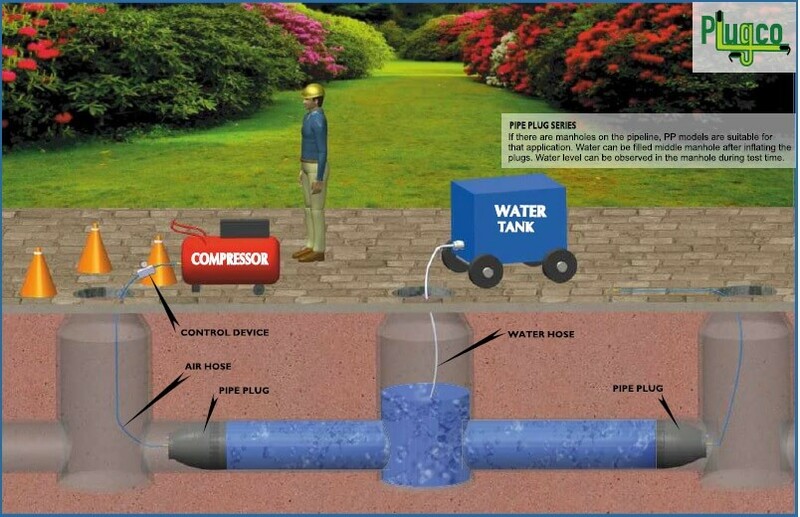 Before entering a manhole or other confined space, thoroughly check for hazardous gasses and proper oxygen levels. 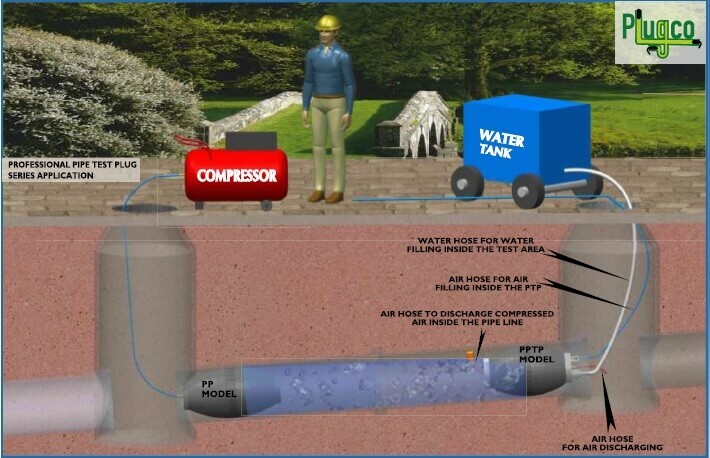 If necessary, ventilate the confined space. Strictly follow confined space safety procedures. 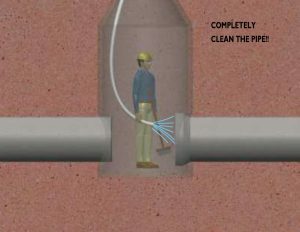 Properly clean the pipeline Clean the pipe of any debris or foreign substance which may reduce the back (Figure 6). 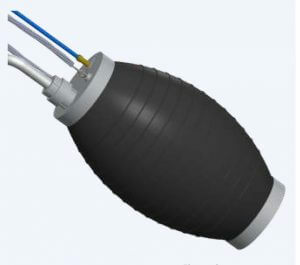 pressure holding capability before the plug is installed. Foreign substances may include grass, oil, mold or any other material that can prevent solid contact between the plug and the pipe wall. WARNİNG!! Failure to properly clean the pipe may result in plug dislodgement or plug failure causing death, serious bodily injury or property damage! The inflation hose must be of sufficient length to inflate or deflate the plug from outside the Danger Zone (Figure 11-12). 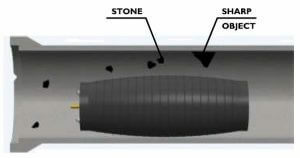 Never inflate the plug over or near sharp objects (Figure 9).Remove all sharp objects, stones and any foreign material from the pipe before inserting the plug. 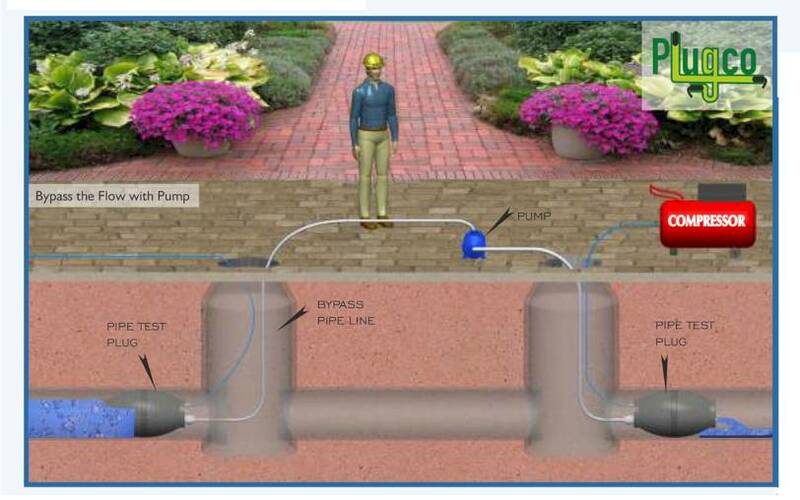 Never allow the plug to protrude from the end of the pipeline during inflation or use. Never inflate the plug over laterals or other openings. Always completely insert the plug into the pipe. Never allow a person to enter the test area (DANGER ZONE) when pressure is applied to the plug. WARNING!! All inflatable products have a risk of suddenly rupturing. Plug failure for any reason may result in death, serious bodily injury and/or property damage! Do not enter the Danger Zone when the plug under pressure! 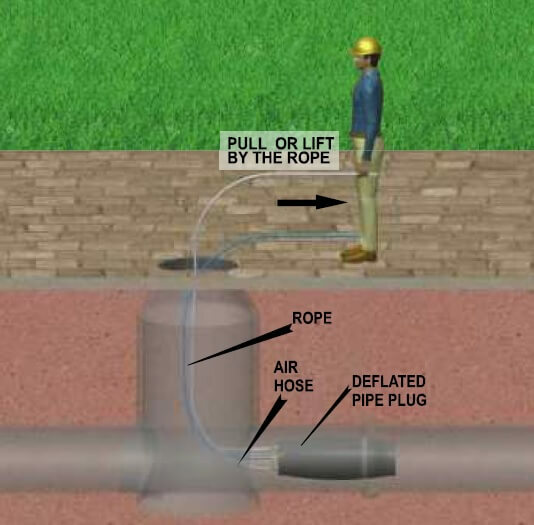 Check the air hose, water hose, rope and their connections to make sure that they are not damaged or leaking. Proper support or bracing must be installed to secure the plug in place if the back pressure limit may be reached or exceeded (Figures 16, 17). Bracing support should contact the front face of the plug and the contact surface should be smooth to distribute forces equally on the plug. Sharp points of contact may damage the plug. 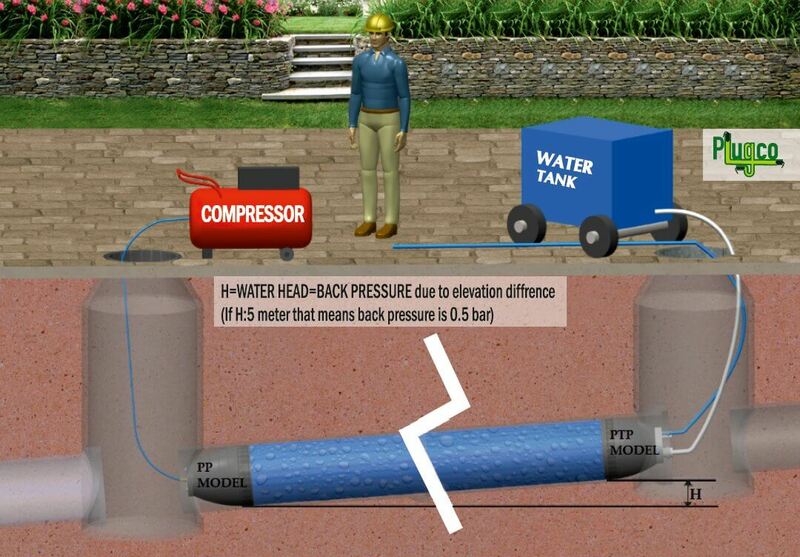 If the back pressure comes from the front side of the plug(Figure 15), use chains or ropes to brace the plug. Never exceed the maximum allowable inflation pressure (working pressure) shown in the data sheet and on the technical information tag on the pipe plug. 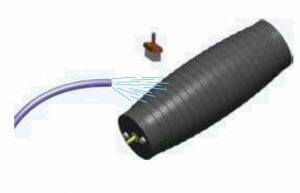 (Figure 18) During plug inflation, monitor the pressure closely on the control device. the working pressure. 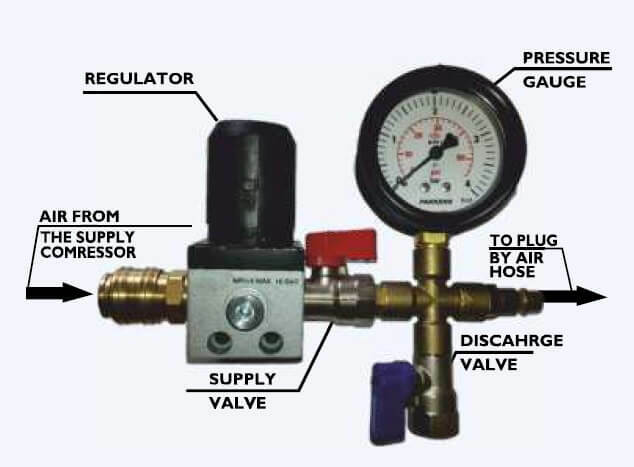 The inflation is done from a location outside the Danger Zone using an inflation hose, a proper pressure source and a calibrated pressure gauge to monitor the working pressure. WARNING!! NEVER exceed the inflating pressure value outlined in the PlugCo Catalog and shown on the technical information tag on the plug! Check the inflation pressure on the control device at least every four hours. 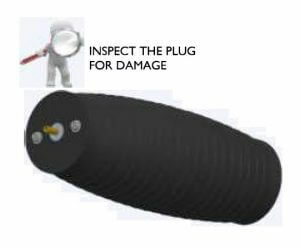 A small volume of inflation air leak through the elastomeric body of every inflatable plug. This lost air must be replaced periodically. After completing the test, release the back pressure (head pressure) completely. Then open the discharge valve and deflate the plug. 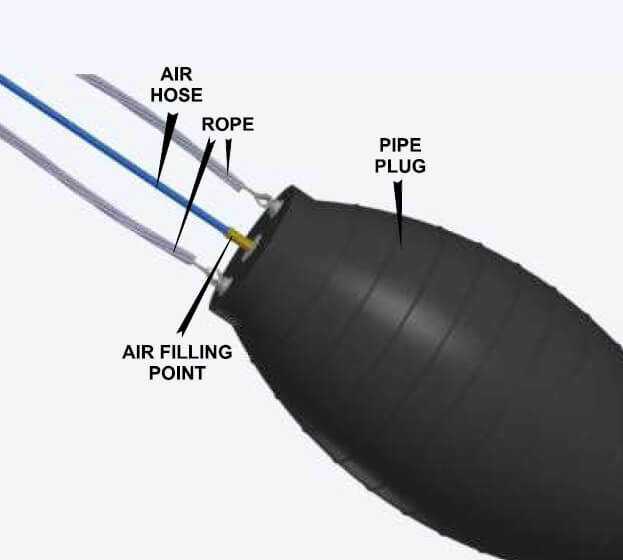 Release the air in the plug from outside the Danger Zone(Figur 11-12) through the inflation hose until the plug is completely deflated. 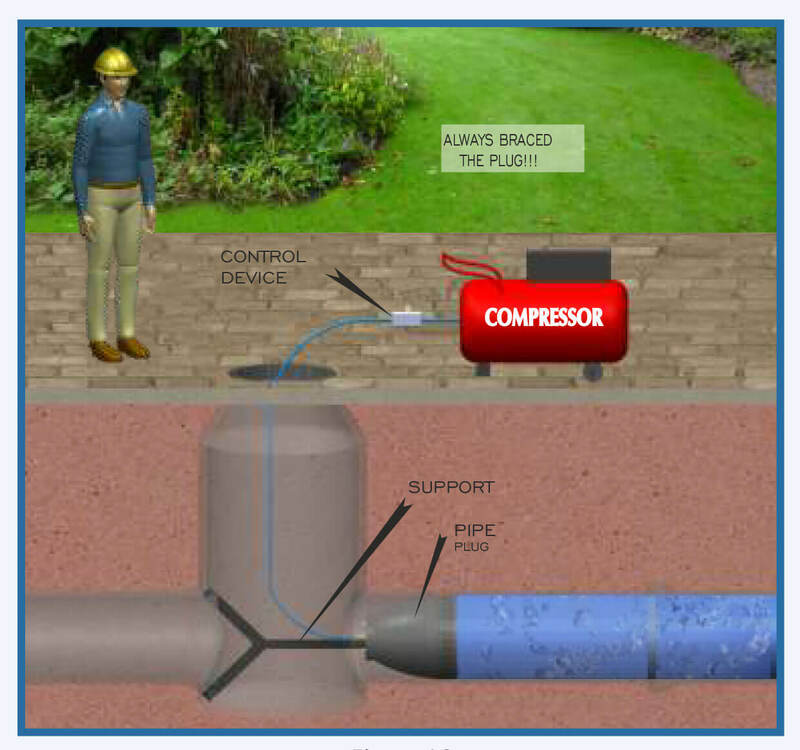 [25 Never remove the plug from the pipeline until all pipeline head pressure is released and the plug is deflated. 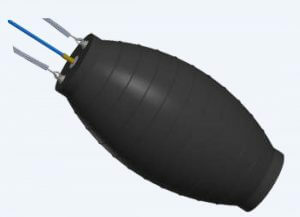 After using the inflatable pipe plug, clean and inspect the plug for damage, tears or any other defect. Store the plug in a clean dry place at room temperature and away from direct sunlight.